“B-roll like that would be cool, but it’s too tricky for us to shoot"
"I found this awesome clip on iStock, should I spend the money on it?" Well, just like you, I have had those same thoughts. As a videographer, b-roll is a crucial part of any video project. You must constantly be on the lookout for great footage and even work them into your scripts if necessary. Well, there are two options. One: go out and shoot the footage you missed the first time. But, this might cause projects to be pushed back as it takes extra time. Alternatively, you can use what we call “Stock Footage.” This is footage that has been professionally shot and is available for purchase through numerous different online sites. In this article, we are going to discuss the pros and cons of stock footage. I will explain how it can help your videos and the benefits of using it; I will also cover the disadvantages of stock footage and how it can hurt your videos. Stock footage is a great option to have. It can really help tell your story better and allow you to fill in the gaps of your video projects. In general, they are always high quality, and when time is of the essence, it just might save the day. For example, let’s say you are shooting an interview with one of your subject matter experts. In the interview, they mention something about teamwork or collaboration within the work environment. If it’s a major point to the message, you would want to highlight that. However, you either forgot to shoot this clip, or you couldn’t get the right people in place. Nevertheless, it’s an important part of your story. Enter stock footage. This situation is easily rectified because you can search on sites like Adobe Stock, Videohive, or Shutterstock amongst others for clips of people collaborating in an office. These sites allow you to purchase and license stock footage, which you can use in any of your videos moving forward as long as your license is up to date. When it comes to selecting stock videos, you can easily search clips that match the resolution of your project. Most stock footage sites advertise two types of resolution: 1920x1080 or 4K. With 4K footage on the rise, this is a nice option to have. Not only are you going to get a piece of footage that matches your project, but it will be perfectly composed, well lit, and stable. This is a level of professionalism that will make your videos stand out and leave people saying wow. This can also allow you to be more creative. If you are a newer videographer and lack the skills to get your shot, this could be the answer. However, as you’ll read below, as a videographer that is trying to become better, you should try to get the b-roll you want first. Not only will you get better over time, you will also start to think and see shots before you need them. There is no argument that buying footage is a huge time saver. It’s easily accessible, and if you know the settings you need, it is easy to find. There will be times that you can’t get out there and shoot the clips you need. You may be too caught up in an edit, or have another project coming up and it is just not going to happen. With stock footage, you’ll have an option to get a shot that you need and be flexible with your time. As with anything, there are pros and cons too. Stock footage is no different. It can’t be used in every situation and sometimes it is just not feasible to use it. Most times, with high-quality footage comes a high price tag. The footage (that’s worth buying) is not cheap and can add up very quickly, especially if you are using 4K footage. For this reason alone, we tend to use stock footage very rarely. In many cases, teams with a limited budget will have to use stock footage sparingly. With this being said, you are paying for some of the best quality, most professional looking footage out there. These clips were shot with multiple member crews and thousands of dollars in equipment. Remember: it’s always about telling a better story and improving the viewer's experience. If this is a way for you to do that, consider if the price should be an issue. With the amount of video content coming out these days, you need to be showing your customers and prospects the ins-and-outs of your business. This can become very hard to do if you are using stock footage for b-roll. It can look impersonal and have a rigid feeling of being staged. When it comes down to selecting footage, you want to choose something that you could recreate in your business environment. As a side note: remember that you want to create a healthy video culture. When you use your employees in b-roll, they have a sense of pride and excitement, which in turn makes them more willing to help with future projects. 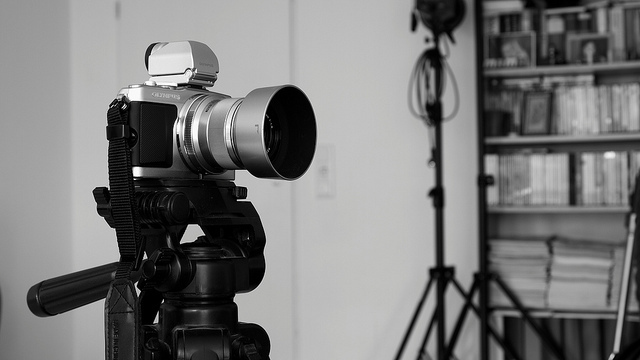 Using stock footage not only affects your videos but can also affect you as the videographer. You were hired to shoot, edit, and create stunning stories and visuals that best share the brand's story. If the option of using stock footage is abused, not only does it hurt your wallet, but it also hurts your growth. This happens in terms of your skills as a videographer as well as your ability to create relationships within the business. As the videographer here at The Sales Lion, it is important that I am trying to improve my craft and gain skills and knowledge in all aspects of video production. That takes the form of video editing techniques, learning about camera equipment, and shooting styles. I must also be able to communicate with my team on projects and ideas I have, assign them tasks and know that, based on the relationship I have created with them, I can count on them to get me what I need. When you use stock footage, you lose the opportunity to get your fellow co-workers involved and engaged in the video making process. When you do that, they are less likely to buy-in and help when you need them. Should you be using stock footage in your videos? Stock footage is a great asset to have in your arsenal. It is, however, something that I recommend you use sparingly and only use if it will truly enhance the viewer experience. At times it may not be the best option. Remember that you want this video to help your customers get to know you better and learn something they might not know already. While stock footage can definitely do that, it can also take away from your message. It is best to be 100% certain that the footage you are going to use will make the best impact for all. If you have any questions please let us know in the comment section below.